Down on the Mississippi, and 12 stories above expectations, you’ll find a southern Louisiana retreat, designed to capture the rich culture of Baton Rouge – and your heart. Live it up, Louisiana-style, in one of 205 elegantly appointed guest rooms or lavish suites. Or, float among the clouds in a rooftop pool, kissed by the sky. This is about living life to its fullest, in legendary fashion. 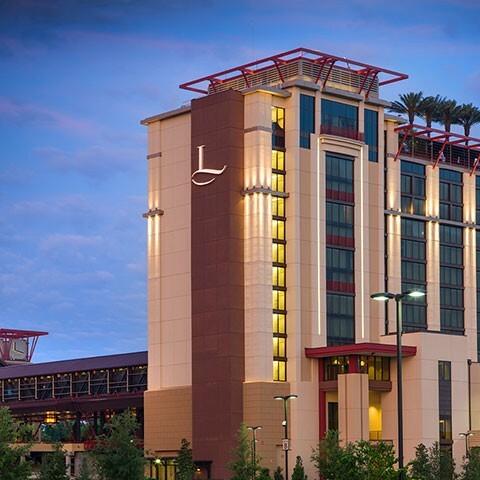 This is L’Auberge Casino & Hotel Baton Rouge. Enjoy four distinct dining destinations. Unlimited, sumptuous flavors. This is where cravings go peacefully into the Louisiana night – and you discover all new ones. To dine at L’Auberge Casino & Hotel is to experience the very best of the region – the freshest seafood, the most comforting classics, beautiful cuts of beef – all served with signature hospitality. A contemporary interpretation of the classic lodge, our casino is a thrilling tribute to the beauty, tradition and energy of Baton Rouge. With nearly 1,500 slot machines and 50 table games, the casino at L’Auberge is jumping with good times, gracious service and a host of unique surprises.